Volaire, a striking 10-storey apartment building on the doorstep of the Melbourne CBD and North Melbourne train station, is set to hit the market this month. 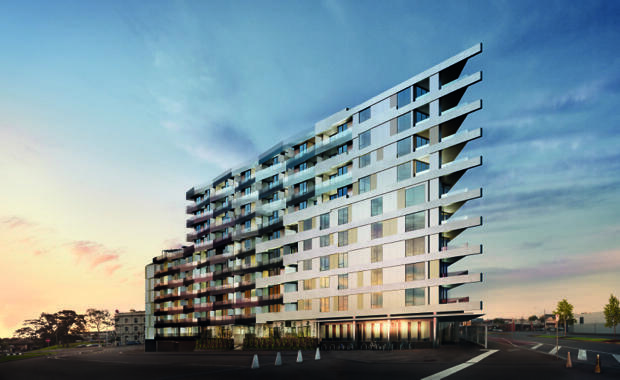 Developed by Cbus Property and designed by award-winning Hayball Architects, Volaire will offer residents panoramic views across Melbourne in a blue chip position with easy access to transport, retail and entertainment. Colliers International Director of Residential Brett Griffith said Volaire would comprise 154 apartments, a grand entrance plaza, generous communal lounge and garden with sweeping views. Basement car parks and storage would be accessible via security coded lifts.